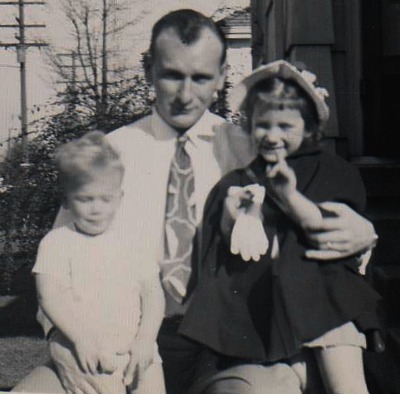 Dad, Corky and me at Russet Street House, North Portland in 1947. Whew! All 31 chapters are completed. Now, I am working with Susan Wells, the book designer to coordinate placing the photos in to book and I think that should wrap up in a few days. Then, Susan will finish the formatting so that I solicit printing bids and finally get the manuscript turned into a book! It would be great to have the bids already, but I can’t get them until I know how many pagers there are going to be, and I don’t know that yet till the formatting is done. If my imaginary conversation with a publisher’s rep is at all realistic, can you see why I am so much better off publishing and promoting Growing Up With G.I. Joe’s myself? At least, that is my story and I am sticking to it, since no publishers are knocking at my door!